Ok, I fell in love with this gold frame before I even put anything inside it…. Now it’s on a whole new level of LOVE! I’m having a hard time dealing with the fact that it’s going to be picked up soon, I want to keep it hanging on my wall display forever! 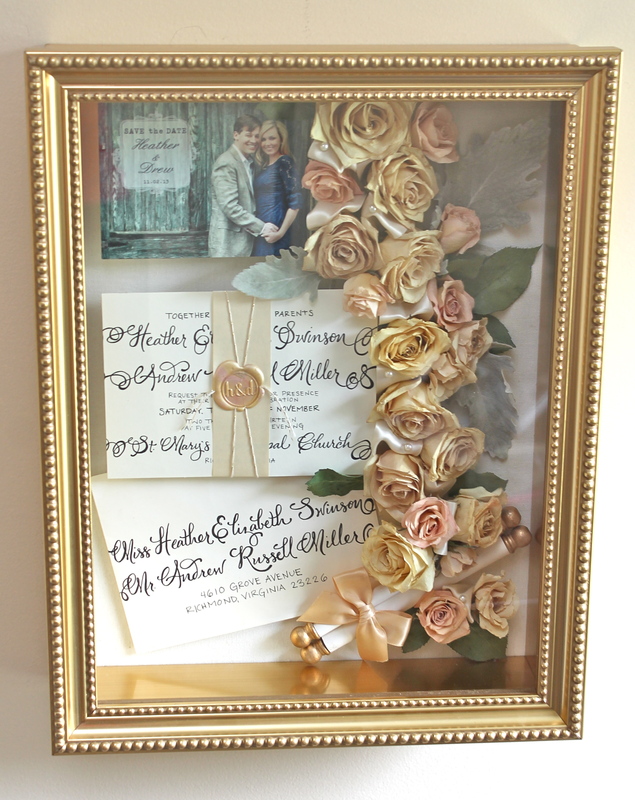 And the custom invitations made by a local Richmond, VA artist Claire Wall are just amazing! The bouquet was originally created by Flowergirls also in Richmond, VA.
Heather’s save the date card was done and Photographed by PW Photography. Love all of the items inside her arrangment to make it extra special and unique to the bride.